What is SaaS Vulnerability Scanner? SaaS Vulnerability Scanner is a network perimeter security and vulnerability intelligence solution developed by CyberSecurityHelp. It is designed to protect the user’s network infrastructure from the outside by scanning and detecting vulnerabilities in the network and searching for potential access points through which threats can enter. A corporate computer network has to have at least one device facing the internet. In most cases, this is the office router. Office routers that have inferior security protocols are vulnerable to viruses, unauthorized remote access, and hacking. 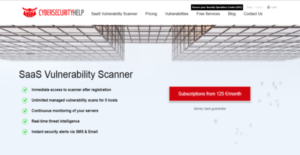 SaaS Vulnerability Scanner helps defend users from these threats by scanning devices such as routers as well as web or mail servers and see if these devices are compromised or dangerously open to intruders. SaaS Vulnerability Scanner by CyberSecurityHelp helps users not only protect their network from outside parties, viruses, and hackers but ensure that all their devices are updated and their firmware are recent and adhere to industry standards. SaaS Vulnerability Scanner by CyberSecurityHelp provides you with a vulnerability intelligence platform that scans, detects, and informs you of vulnerabilites that exists in your network which can be exploited by hackers, unauthorized parties, and business adversaries. If they manage to get inside your network, these people can gain access to corporate data and other sensitive and confidential information. SaaS Vulnerability Scanner prevents that scenario from ever happening. The software uses a combination of human and machine learning as well as passive fingerprinting techniques to perform a comprehensive scan of your network infrastructure. The scanning process is done from the outside, ensuring that it will not cause any memory corruption, consume excessive resources, and cause assertion to fail. SaaS Vulnerability Scanner can also scan misconfigured web-based services and applications that face the internet. Any application that contain any dangerous code will be detected and you will be informed immediately. Vulnerability intelligence can cost you thousands of dollars a year as it would require you to field a team of security analysts to ensure that your network doesn’t have breach points and holes that intruders can access. With SaaS Vulnerability Scanner, you don’t have to spend good money to hire a network security team. You save thousands of dollars and enjoy a great deal of protection for your network with this friendly and highly efficient security platform. What Problems Will SaaS Vulnerability Scanner Solve? Every company has at least one device facing the Internet – the office router. A compromised office router is all your corporate adversary needs to gain unrestricted access to your local office network and corporate intelligence. SaaS Vulnerability Scanner scans all your routers, devices, your entire computer network to see if there is a way for intruders to compromise it. All router and management ports should not be accessible via the Internet and its firmware should be up-to-date. SaaS Vulnerability Scanner is a cost-effective 24/7 solution for real-time security monitoring of your network perimeter and reliable vulnerability intelligence. There are well-liked and widely used applications in each software group. But are they essentially the best fit for your organization’s unique needs? A trendy software solution may have thousands of subscribers, but does it present what you need? For this reason, do not blindly invest in popular systems. Read at least a few SaaS Vulnerability Scanner reviews and consider the elements that you want in the software such as the fees, main features, available integrations etc. Then, select a few systems that fit your wants. Check out the free trials of these products, read online comments, get information from the seller, and do your research meticulously. This in-depth homework is sure to assist you choose the finest software platform for your firm’s special needs. How Much Does SaaS Vulnerability Scanner Cost? We realize that when you make a decision to buy IT Security Software it’s important not only to see how experts evaluate it in their reviews, but also to find out if the real people and companies that buy it are actually satisfied with the product. That’s why we’ve created our behavior-based Customer Satisfaction Algorithm™ that gathers customer reviews, comments and SaaS Vulnerability Scanner reviews across a wide range of social media sites. The data is then presented in an easy to digest form showing how many people had positive and negative experience with SaaS Vulnerability Scanner. With that information at hand you should be equipped to make an informed buying decision that you won’t regret. What are SaaS Vulnerability Scanner pricing details? What integrations are available for SaaS Vulnerability Scanner? If you need more information about SaaS Vulnerability Scanner or you simply have a question let us know what you need and we’ll forward your request directly to the vendor.